Place stencil over piece of construction paper. Pinch sponge with clothes pin. 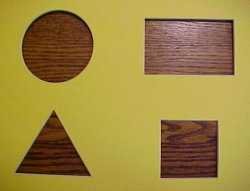 Dip in paint and apply to stencil to reproduce the four shapes.